[CLOSED] PERFECT PROPOSALS! TELL US YOUR PERFECT PROPOSAL AND WIN A £150 SPA DAY VOUCHER! There can be little doubt that, whether you’re down on one knee or you’re saying “yes”, an engagement is a truly magical moment and the start of a fantastic adventure in life! 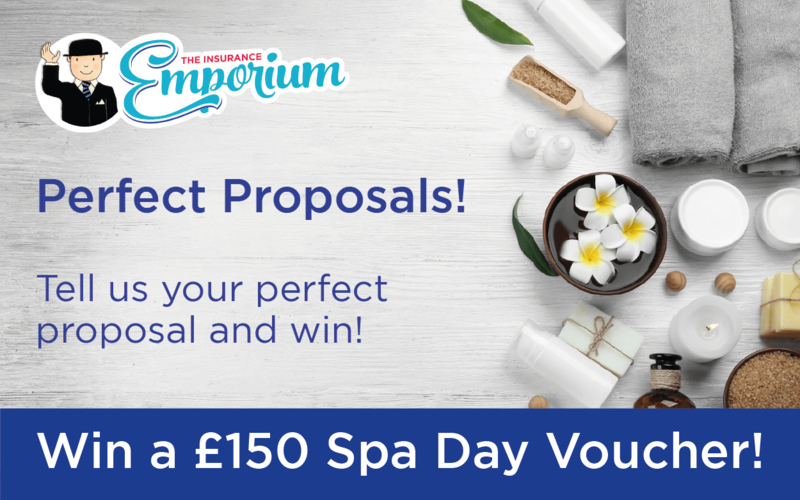 At The Insurance Emporium, we appreciate that planning a wedding can be a tiring task, so that’s why we’re giving away a £150 spa day voucher! Whether you’ve been putting in the hours sorting out your big day, you’re celebrating years of marital bliss or you’re still waiting to find ‘the one’, a spa day could be the perfect way to unwind and relax! If you enter our Perfect Proposals competition, you could win a voucher to help you on your way! You don’t have to be engaged or married to enter, we just want to know what would make your perfect proposal! Would it be on a romantic city break, in the comfort of your own home or something completely different?! Simply click the link below, fill in your details and you could find yourself being pampered on a spa day! If you are in the process of planning your big day, you might want to consider getting some insurance for your wedding. At The Insurance Emporium, our Wedding Insurance policies are available with a simple one-off payment and seven levels of cover to choose from! Head to The Insurance Emporium today to find out more! This blog is in no way sponsored, endorsed or administered by, or associated with buyagift.co.uk.